The 1837 treaty is also known as the Treaty of St. Peters (the former name of Mendota). It was the first treaty in which the Anishinaabe people ceded major areas of land in what would become the state of Minnesota,. The pleasure of hunting, fishing, and gathering the wild rice upon the lands, the rivers and the lakes included in the territory ceded, is guaranteed to the Indians, during the pleasure of the President of the United States. … the State of Minnesota prosecuted Band members for violation of state conservation laws for many decades. In 1990, the Mille Lacs Band was ready to sue the state of Minnesota because too many Band members were being wrongly arrested for hunting and fishing in the ceded territory. But to avoid unnecessary and unpleasant confrontations, the Band tried to settle the issue out of court. The case — Minnesota v. Mille Lacs Band of Chippewa Indians— went all the way to the U.S. Supreme Court and the Mille Lacs Band won. Map shows current Line 3 and Enbridge’s proposed route. Compare to map of the 1855 Treaty area. Since the treaty did not deny the hunting, fishing and gathering rights, the Anishinaabe treaty signers at the time would have understood that they existed, just like they had in other treaties the U.S. government made with their relatives, including the 1837 Treaty. The Project’s impacts to indigenous populations are of serious concern to the Commission. 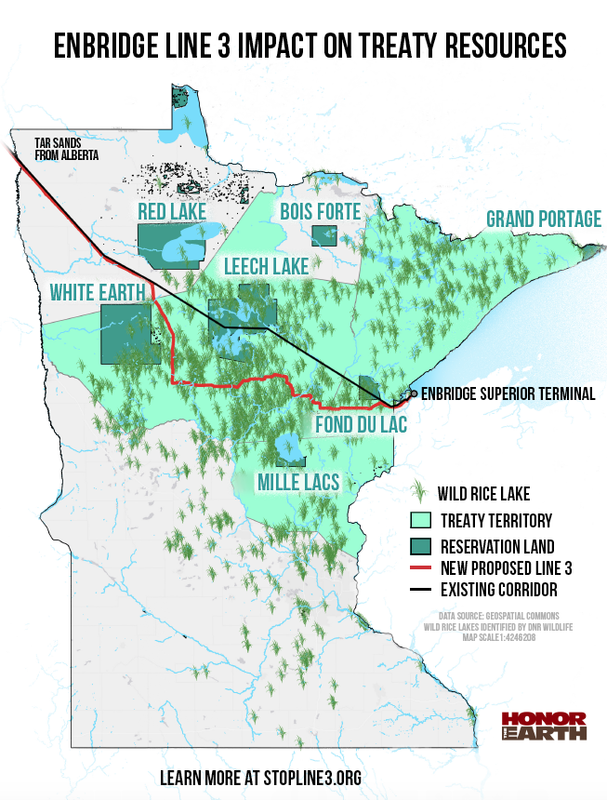 The Project route would traverse territory that was originally ceded by Minnesota’s Ojibwe and Chippewa tribes (collectively referred to as the Anishinaabe tribes or people) through treaties with the federal government, which determine the rights the Tribes retain to hunt, fish, and gather wild rice and other resources in these lands in accordance with their traditional practices. [T[he ALJ Report included a section discussing the treaties between the federal government and the Native American sovereign nations located in Minnesota. The Commission concludes that this discussion is not necessary to the Commission’s decision, and therefore does not adopt these findings. The PUC could have identified treaty issues as important and unresolved. Since treaties are a federal matter, the Commissioners could have acknowledged that the PUC was not the right venue to adjudicate those issue — but the pipeline should not move forward until they are resolved. It did not. Instead, it green-lighted the project, forcing a costly legal challenge on the Anishinaabe people.